Different wall materials require various types of fasteners to secure art firmly to wall (not included) – use fasteners for mounting that are suitable. Note: Color discrepancies may occur between this product and your computer screen. The solid oak top is finished with a light colored stain with plate groove. Bear Shelf - $46.69 (in store)A mamma bear out for a stroll with her two cubs meanders through the evergreen forest with the mountains as a beautiful backdrop on this shelf scene as it flows across all three sides. The solid oak top is finished with a light stain and has a plate groove if you plan to display decorative plates. The bottom portion is finished with a durable powder coating in Black Wrinkle which is an elegantly textured black with slate soft metallic shimmering undertones and matte finish. Tractor Shelf - $46.69 (in store)A tractor working among picturesque rolling fields draws nostalgia from the countryside. This charming scene allows your mind to escape daily hassles while giving your space added storage. Designed for beauty and utility, a lightly stained solid oak-top board compliments the metal detail giving you a sturdy surface equipped with a plate groove. The metal section is finished with a durable powder coating in a decorative Black Wrinkle, an elegantly textured black with soft slate metallic shimmering undertones and matte finish. Deer Shelf - $46.69 (in store)wo graceful bucks relax at the base of a majestic mountain background adding a sense of timeless peaceful serenity to your space. Designed for beauty and utility, a lightly stained solid oak-top board compliments the metal detail giving you a sturdy surface equipped with a plate groove. The metal section is finished with a durable powder coating in the color Copper Vein, which is a durably textured, rich deep brown with slight black undertones and complimentary semi-gloss finish. Duck Shelf - $46.69 (in store)You quickly catch sight of the two Mallards coming in for a landing as they find a good resting spot within the protective cover of the cattail marsh to rest up before they move on to reach their next destination. Designed for beauty and utility, a lightly stained solid oak top board compliments the metal detail giving you a sturdy surface equipped with a plate groove. The metal section is finished with a durable powder coat finish of Green Vein with the tops of the cattails Copper Vein. The Green Vein is slightly textured with no undertone and a semi-gloss finish. The Copper Vein is a textured rich deep brown with slight black undertones with a semi-gloss finish. Pheasant Shelf - $46.69 (in store)Two pheasants ascend from the brush pursuing adventure. Their dawning exploration framed by foliage allows the mind to wander while bringing the beauty of nature to your space. 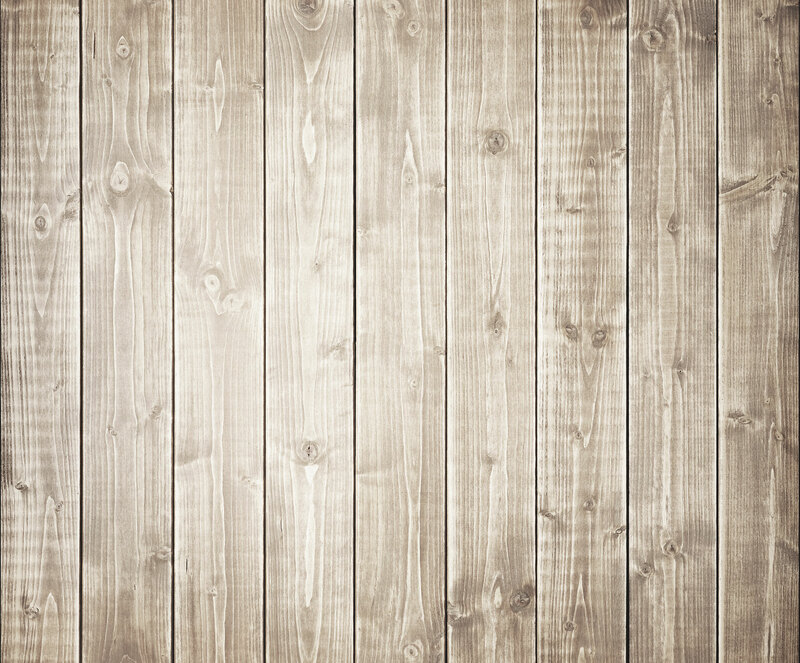 Designed for beauty and utility, a lightly stained solid oak-top board compliments the metal detail giving you a sturdy surface equipped with a plate groove. The metal section is finished with durable powder coatings, both Green and Copper Vein which is a textured, rich deep brown with slight black undertones. 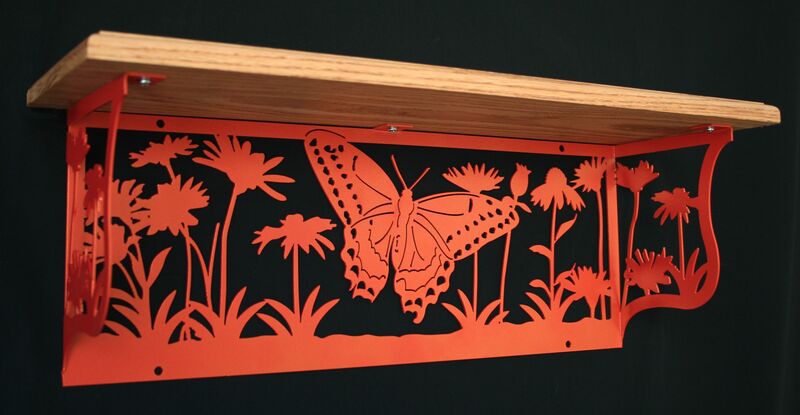 Butterfly Shelf - $46.69 (in store)This shelf brings attention to its self as your eye is drawn into the collection of wild flowers with the butterfly fluttering through the blooms to pick just the right one for landing on. The scene flows through all three sides with a stunning Orange Gold Vein, a textured deep red-orange with gold metallic fleck that's slightly textured and finished with a flawless semi-gloss. Horse Shelf - #46.69 (in store)Two gallivanting wild horses gallop across the open countryside nestled amongst foothills. Their gentle grace allows this beautiful piece to be a wonderful addition to your space. Designed for beauty and utility, a lightly stained solid oak-top board compliments the metal detail giving you a sturdy surface equipped with a plate groove. The metal section is finished with a durable powder coating in the color Copper Vein which is a textured, rich deep brown with slight black undertones. 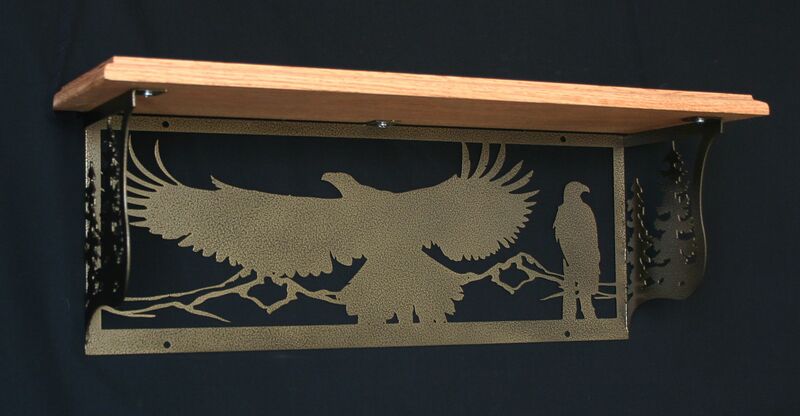 Eagle Shelf - $46.69 (in store)A majestic eagle spreads his proud wings among evergreen trees on either side with his mate at its side perched on the tree branch - both ever watchful for their next meal. This gorgeous creature brings the beauty of nature to your space. Designed for beauty and utility, a lightly stained solid oak top board compliments the metal detail giving you a sturdy surface equipped with a plate groove. The metal section is finished with a durable powder coating in Gold Vein with slightly textured antique gold having rich deep brown subtle accented undertones.